Background and objectives Residual kidney function contributes to the clearance of antibiotics excreted by the kidneys, lowering the antibiotic concentration, which may adversely affect the treatment of peritoneal dialysis–associated peritonitis. The objective of our study was to examine the relationship between residual kidneyfunction and peritonitis treatment outcomes. Design, setting, participants, & measurements Our study included 181 participants who experienced 339 episodes of Gram-positive, Gram-negative, and culture-negative peritoneal dialysis–associated peritonitis at a single centerfrom 2003 to 2010. Episodes were categorized according to participants’ urinary creatinine clearance (0, >0–5, and >5 ml/min). 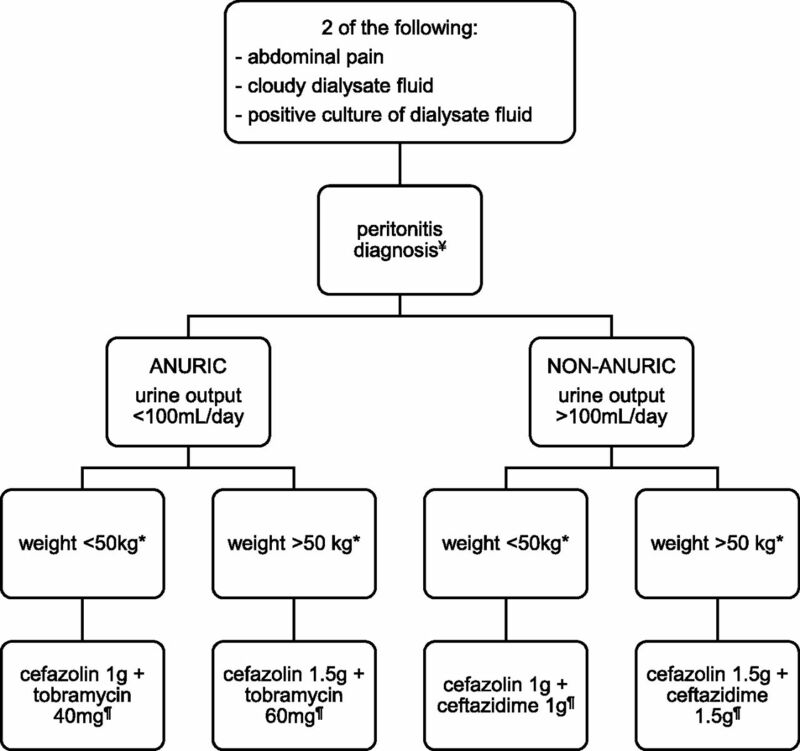 The data were analyzed using generalized estimating equation models to determine the covariate-adjusted association between urinary creatinine clearance and treatment failure (defined as relapse or recurrent peritonitis episodes, peritoneal catheter removal, or death from any cause during peritonitis treatment). Results Among episodes of peritonitis due to Gram-positive organisms or culture-negative infections, those experienced by participants with urinary creatinine clearance >5 ml/min had significantly higher odds of treatment failure than episodes experienced by anuric participants (27 of 80 versus 20 of 119 episodes resulting in treatment failure for creatinine clearance >5 versus 0 ml/min; odds ratio, 6.80; 95% confidence interval, 2.37 to 19.6). Episodes experienced by participants with creatinine clearance >0–5 ml/min also had significantly higher odds of treatment failure than episodes experienced by anuric participants (14 of 64 episodes resulting in treatment failure for creatinine clearance >0–5 ml/min; odds ratio, 2.87; 95% confidence interval, 1.12 to 7.35). The odds of relapse and recurrent peritonitis among participants with creatinine clearance >5 ml/min was also significantly higher compared with in anuric participants (17 of 80 versus 12 of 119 episodes resulting in relapse and recurrence for creatinine clearance >5 versus 0 ml/min; odds ratio, 6.76; 95% confidence interval, 1.90 to 23.8). Among participants with Gram-negative peritonitis, creatinine clearance was significantly associated with neither treatment failure nor relapse and recurrent peritonitis. Conclusions Residual kidney function as measured by greater urinary creatinine clearance was associated with treatment failure among participants with Gram-positive and culture-negative peritonitis. Peritonitis remains a major complication and cause of morbidity and mortality for participants on peritoneal dialysis (PD) (1). Prompt diagnosis and initiation of appropriate antibiotics are essential to prevent relapse, catheter removal, permanent transfer to hemodialysis, and death (2). Antibiotics are ‎administered intraperitoneally to achieve a high concentration at the site of infection. After each intermittent dose is absorbed, subsequent antibiotic-free dwells rely on the back diffusion of antibiotic ‎from blood to the peritoneum to maintain antimicrobial activity until the next intraperitoneal dose of antibiotic. Pharmacokinetic studies have shown that residual kidney function contributes to overall antibiotic clearance and lowers the antibiotic concentration in the blood (3,4). Although previous studies did not observe a difference in treatment outcomes between anuric and nonanuric participants (5,6), they did not specifically examine outcomes in participants with different degrees of residual kidney function. Given that a proportion of participants on PD start with a significant amount of residual kidney function, the clinical consequence of clearance of antibiotics by the kidneys is unknown. The objective of this study was to examine the relationship between residual kidney function and peritonitis treatment outcomes. Data were collected retrospectively for all peritonitis episodes in the University Health Network Home Peritoneal Dialysis Program from January 1, 2003 to December 31, 2010. Participants with signs and symptoms of peritonitis were instructed to bring a dialysate bag for analysis each day of their peritonitis treatment, and data regarding signs and symptoms, antibiotic dose, dialysate culture and sensitivity, and intraperitoneal white blood cell (WBC) count were recorded daily. Peritonitis was diagnosed if the participant had any two of abdominal pain, cloudy dialysate fluid, or positive culture of dialysate fluid along with an elevated WBC count or >50% neutrophils in PD fluid. The peritonitis treatment protocol is shown in Figure 1, and the protocol remained the same throughout the study period. The antibiotics could be modified on the basis of PD effluent culture and sensitivities, but the antibiotic concentrations were not routinely monitored. Episodes of polymicrobial, fungal, and mycobacterial peritonitis were excluded. Episodes were excluded if there was no documented urinary creatinine clearance or for missing data. The study was approved by the hospital research ethics board, and all authors adhered to the Declaration of Helsinki. Peritonitis treatment algorithm. Patients who are allergic to cefazolin receive vancomycin at the following doses: if <50kg, 1g in 1 exchange, if >50 kg, 2g in 1 exchange, frequency is every 7 days if anuric and every 5 days if non-anuric. Antibiotics may be modified based on PD effluent culture and sensitivities, but antibiotic concentrations are not routinely monitored. Anuric patients started on tobramycin with culture results demonstrating a Gram negative organism continue on tobramycin unless sensitivities show the infection is resistant (i.e., do not switch to ceftazidime). *Actual body weight used for dosing. ¥Elevated PD effluent cell count or >50% neutrophils with or without positive cultures in addition to the above symptoms is diagnostic for PD peritonitis. ¶Antibiotics are administered intraperitoneally once daily and dwell for at least 6 hours. The primary outcome of interest was treatment failure defined as a composite of relapse or recurrent peritonitis episodes, peritoneal catheter removal, or death from any cause during peritonitis treatment. Relapse was defined as a peritonitis episode that occurred within 4 weeks of completion of antibiotic therapy with the same organism, and a recurrent episode was another peritonitis episode within 4 weeks of completion of antibiotic therapy with a different organism. Recurrent episodes were included in the composite outcome to capture potentially related culture-negative episodes. Residual kidney function as measured by urinary creatinine clearance was determined from clinical evaluations using 24-hour urine collection within 3 months of each peritonitis episode. The creatinine clearance measured as close in time to the peritonitis episode (either before or after) was used for the purposes of this study. Urinary creatinine clearance was categorized as 0, >0–5, or >5 ml/min. Time to intraperitoneal WBC count resolution was defined as the number of days from the diagnosis of peritonitis to the first documented normalization of intraperitoneal leukocytosis. Categorical variables are expressed as counts and proportions, and continuous variables are expressed as mean±SD. The data were analyzed using generalized estimating equation models with a logit link function to determine the covariate-adjusted association between urinary creatinine clearance and treatment failure. Generalized estimating equation models are an extension of multivariable regression methods used to control for correlations among clustered records. In this study, the model accounted for multiple peritonitis episodes contributed by the same participant. Other covariates in the model included age, duration of PD, actual body weight, diabetes status, PD modality (continuous ambulatory peritoneal dialysis [CAPD] versus continuous cyclic PD), urinary creatinine clearance, and infection type (culture-negative peritonitis, Gram-positive peritonitis, or Gram-negative peritonitis). In all analyses, the interaction term between urinary creatinine clearance and PD modality was not significant and was, therefore, removed from the model. However, the interaction term between urinary creatinine clearance and infection type was significant; therefore, the data are presented separately on the basis of infection type. Additionally, culture-negative peritonitis was analyzed together with Gram-positive peritonitis, because they were presumed to be due to Gram-positive organisms; this was reflected in the treatment algorithm. In a secondary analysis, the same model was used to examine the odds of relapse and recurrent peritonitis. All reported tests were two sided, and a P value <0.05 was considered significant. Statistical analyses were conducted with SAS, Version 9.3 (SAS Institute, Cary, NC). There were 516 episodes experienced by 257 participants during the study period; 177 episodes were excluded from the analysis for the following reasons: 94 were polymicrobial infections, eight were fungal infections, 55 did not have corresponding urinary creatinine clearances, and 20 were missing data. A total of 339 episodes experienced by 181 participants were included in the analysis; 85 participants experienced more than one episode of peritonitis during the study period (Supplemental Table 1). Tables 1 and 2 show the baseline characteristics. Of all peritonitis episodes, 155, 87, and 97 occurred when the urinary creatinine clearance was 0, >0–5, or >5 ml/min, respectively. The mean numbers of exchanges in each creatinine clearance group were 5.8±1.8 in 0 ml/min, 4.9±1.3 in >0–5 ml/min, and 4.3±1.2 in >5 ml/min. Table 3 shows the organisms responsible for the 339 peritonitis episodes. Coagulase-negative Staphylococcus was the most common among Gram-positive organisms followed by Streptococcus sp. and Staphylococcus aureus. Escherichia coli and Klebsiella sp. were the most common Gram-negative organisms. Culture-negative peritonitis accounted for 13% of all peritonitis episodes. Among episodes of culture-negative and Gram-positive peritonitis, 74% were treated with cefazolin, and 23% were treated with vancomycin. The majority (63%) of episodes of Gram-negative peritonitis were treated with ceftazidime, and 29% were treated with tobramycin. All episodes were treated with antibiotics at doses equal to or greater than doses per body weight recommended by the International Society of Peritoneal Dialysis (ISPD) guidelines, except for nine episodes that were treated with cefazolin, four episodes that were treated with vancomycin, and one episode that was treated with tobramycin. These episodes were approximately evenly distributed among the subgroups of residual kidney function. Oral antibiotics were used concurrently among 10% of episodes of Gram-positive and culture-negative peritonitis (n=27) and among 41% of episodes of Gram-negative peritonitis (n=31) (Supplemental Table 2). Treatment failure occurred in 87 episodes, including 30 relapses, 16 recurrent peritonitis episodes, 34 catheter removals, and seven deaths. The median times to resolution of intraperitoneal WBC count for urinary creatinine clearance groups of 0, >0–5, and >5 ml/min were 3, 3, and 4 days, respectively. Among episodes of Gram-positive and culture-negative peritonitis, urinary creatinine clearance was significantly associated with treatment failure. Specifically, participants with urinary creatinine clearance >5 ml/min had higher odds of treatment failure than those who were anuric (odds ratio [OR], 6.80; 95% confidence interval [95% CI], 2.37 to 19.6), and participants with urinary creatinine clearance >0–5 ml/min had higher odds of treatment failure than those who were anuric (OR, 2.87; 95% CI, 1.12 to 7.35) (Table 4). The odds of relapse and recurrent peritonitis among those with urinary creatinine clearance >5 ml/min was also significantly higher compared with in anuric participants (OR, 6.76; 95% CI, 1.90 to 23.8) (Table 4). Among episodes of Gram-negative peritonitis, urinary creatinine clearance was not significantly associated with treatment failure (Table 5). Urinary creatinine clearance was also not significantly associated with relapse and recurrent Gram-negative peritonitis (Table 5). A sensitivity analysis was conducted including only episodes in which initial antibiotic therapy was continued for the duration of peritonitis therapy (64% of all culture-negative and Gram-positive episodes and 47% of all Gram-negative episodes). Among episodes of Gram-positive and culture-negative peritonitis in this sensitivity analysis, participants with urinary creatinine clearance >5 ml/min had higher odds of treatment failure than those who were anuric (OR, 3.95; 95% CI, 1.20 to 12.99) (Supplemental Table 3). Although other results of the sensitivity analyses were not found to be statistically significant, point estimates of the OR were trending in the same direction as overall results (Supplemental Tables 3 and 4). This study shows that, for Gram-positive and culture-negative PD-associated peritonitis, increasing residual kidney function is associated with increasing odds of peritonitis treatment failure. This observation is consistent with the hypothesis that greater residual kidney function allows for more clearance of antibiotics by the kidneys, which in turn, leads to lower blood and subsequent intraperitoneal antibiotic concentrations and therefore, higher risk of treatment failure. Previous studies and the ISPD guidelines have generally dichotomized residual kidney function as either present or absent (7–9). This study focused on the varying degrees of urinary creatinine clearance, especially those with clearances >5 ml/min. Clearance of antibiotic by the kidneys contributes significantly to total clearance. Prior studies have shown that there is a positive correlation between urinary creatinine clearance and the clearance of cefazolin (7), vancomycin (8), tobramycin (7), and ceftazidime (9). In these studies, clearance of antibiotic by the kidneys accounted for 24%–40% of total clearance. Although most of the pharmacokinetic parameters were not statistically different in these studies between anuric and nonanuric participants, the mean urinary creatinine clearances were all <5 ml/min and therefore, might not be sufficiently different to show clinical difference. The sample sizes were also relatively small. Achieving adequate antibiotic concentration is an important factor in peritonitis treatment. Using vancomycin as an example, Mulhern et al. (10) reported in 31 episodes of Gram-positive peritonitis that those who relapsed had significantly lower mean trough serum vancomycin concentrations compared with those who did not (7.8 versus 13.7 mg/L). Dahlan et al. (11) also reported in 35 incident episodes of coagulase-negative Staphylococcus peritonitis that the mean trough vancomycin concentration was significantly lower in participants who relapsed compared with participants who did not (13.3 versus 18.2 mg/L). In contrast, Stevenson et al. (12) did not find a significant difference in trough vancomycin concentrations between those who achieved clinical cure and those who did not in 150 episodes of Gram-positive or culture-negative peritonitis. This observation might be explained by the high empirical dose used and the similar concentrations achieved by both groups. Blunden et al. (5) retrospectively reviewed the treatment outcomes of 301 participants with peritonitis. Although they did not find any significant relationship between trough vancomycin concentration at day 5 and cure rate, subsequent doses were increased if the day 5 concentration was low. Therefore, the concentration at day 5 might not be representative of the concentration during the majority of the course of the treatment. Given that monitored serum levels of cefazolin and ceftazidime are not commonly available, we took a pragmatic approach to determine the relationship between residual kidney function and treatment outcomes. Gram-positive and culture-negative peritonitis were analyzed separately from Gram-negative peritonitis, because the antibiotics used have very different pharmacodynamic properties. Both cefazolin and vancomycin exhibit time-dependent bacterial kill, where bactericidal effect is correlated with the time that the drug concentration is above the minimum inhibitory concentration (MIC) (13). Higher residual kidney function can lower the concentration and effectively reduce the time above MIC. In contrast, tobramycin exhibits concentration-dependent bacterial kill, where the bactericidal effect is correlated with peak drug concentration instead of time above the MIC (13). Tobramycin also exhibits postantibiotic effect, where bacterial growth continues to be inhibited despite drug concentrations below the MIC. Both of these characteristics allow tobramycin to be given once daily. Furthermore, because of the dosing algorithm, all participants in this study (except 1) received doses greater than the ISPD recommendation of 0.6 mg/kg (average dose in this study was 0.9 mg/kg). These factors might explain why higher residual kidney function resulting in lower concentration near the end of the dosing interval did not affect the treatment outcome of Gram-negative peritonitis. Similar to cefazolin, ceftazidime exhibits time-dependent bacterial kill and would be susceptible to the effect of residual kidney function (13). Indeed, in a study of ten participants with CAPD and a mean urinary creatinine clearance of 3.1 ml/min, ceftazidime at 1 g intraperitoneally once daily resulted in the dialysate concentration below the MIC 17%–26% of the time each day (14). However, we anticipated that the number of participants treated with ceftazidime would be low, and therefore, the analysis is susceptible to a statistical type 2 error. The interaction between PD modality and urinary creatinine clearance was tested on the basis of the hypothesis that the combination of higher clearance of the cycler and more residual kidney function would further amplify the association. However, lower peritoneal clearance while off the cycler during the long-day dwell combined with administering the antibiotics for the long-day dwell might have offset the higher 24-hour clearance, such that the total daily antibiotic exposure was similar. Therefore, the interaction term was not significant in the model, and neither was PD modality. This is consistent with the observation by Rüger et al. (15) that no difference in cure rate was observed between CAPD and ambulatory PD. We also examined the number of dialysate exchanges in each creatinine clearance group and found that the highest average number of exchanges was in the 0-ml/min group. (5.8±1.8 in 0 ml/min, 4.9±1.3 in >0–5 ml/min, and 4.3±1.2 in >5 ml/min). If the number of exchanges was contributing significantly to intraperitoneal antibiotic clearance, we would expect to see a higher treatment failure rate among the group with the highest number of exchanges, and in fact, we observed the opposite. Therefore, variability in the number of exchanges does not seem to be affecting the outcome of this study. This study has several limitations. We did not examine antibiotic concentration in relation to urinary creatinine clearance and treatment outcomes. However, this approach is more reflective of real world experience, because antibiotic levels for cefazolin and ceftazidime are not readily available. Although vancomycin levels are readily available in clinical practice, they were not routinely monitored during the study period. We used urinary creatinine clearance to categorize tertiles of kidney function instead of an average of urea and creatinine clearance. The antibiotic dosing protocol was also different from the current ISPD recommendations. Episodes were not excluded if the participant was taking an oral antibiotic, and we did not account for oral antibiotic use in the analysis. Among Gram-positive and culture-negative episodes of peritonitis, oral antibiotic use was minimal (n=27; 10%), and these episodes were approximately evenly distributed among the urinary creatinine clearance subgroups; thus, we would not expect oral antibiotic use to have an effect on the outcome of this study. Among Gram-negative episodes of peritonitis, oral antibiotic use was more common (n=31; 41%), but these episodes were approximately evenly distributed among the urinary creatinine clearance subgroups. Lastly, the nonrandomized design meant that there was a risk of other confounders contributing to treatment failure. Despite these limitations, our results suggest the need to increase antibiotic dose in patients with greater residual kidney function. One alternative strategy may be continuous dosing of antibiotics, which includes adding antibiotics to every bag over the 24-hour period. This approach has the potential to reduce the probability of subtherapeutic concentrations of antibiotics. The ISPD guidelines provide both intermittent and continuous dosing recommendations for antibiotics used to treat peritonitis and note that there are few data comparing the efficacy of these two dosing strategies. In conclusion, among Gram-positive and culture-negative episodes of PD-associated peritonitis, participants with urinary creatinine clearance, particularly those with clearances >5 ml/min, had higher odds of treatment failure compared with participants who were anuric. This observation supports and highlights the importance of dosing antibiotics on the basis of the degree of residual kidney function to ensure adequate concentration for effective treatment. Additional prospective studies to explore the effects of residual kidney function on pharmacokinetics and treatment outcomes as well as the establishment of dosing guidelines for antibiotics on the basis of the degree of residual kidney function are needed to improve the outcomes of peritonitis treatment. J.M.B. is a consultant for Baxter Global, Keryx Biopharmaceuticals, and Rockwell Medical and a speaker for Baxter Global, DaVita Healthcare Partners, Janssen Ortho, Baxter Canada, US Renal Care, and Dialysis Clinic, Inc. The authors thank Jeffrey Perl for helpful comments and Judi Shea, Karen Ng, and Saadia Fazil for their administrative assistance. Published online ahead of print. Publication date available at www.cjasn.org. See related editorial, “Effective Treatment of PD Peritonitis,” on pages 1919–1921. This article contains supplemental material online at http://cjasn.asnjournals.org/lookup/suppl/doi:10.2215/CJN.00630117/-/DCSupplemental.